A friend and reader emailed me the other day with a question. I thought it might be of interest to you as well. She wrote: “I checked online to see how many hours of daylight we’re getting in our area these days. It’s 10 hours and 8 minutes. I’ve heard that so long as you have at least 10 hours — things will continue to grow if temps are not too low. And that daylight is the main reason that things stop growing. Here’s the answer I gave — slightly adjusted for even more clarity. I’ve also added a few things. Some time this month light will go to less than 10 hours. Then in January (towards the end I think) it goes back to 10 hours plus. I gardened for years without knowing that, but I do think it’s an interesting piece of information that can be useful. An example of it’s use: I start planting using the wintersown method on December 25th because that’s the winter solstice when sun is at it’s lowest. But henceforth the light starts changing and we will continue to gain more minutes of light again with each passing day. There would be no need to plant if the light were continually decreasing. #1 – If you can get things started for fall in August — you’ll have much more growth on fall and winter crops since they’ll have time to grow more because of more light and warmth in August. Even getting started in September makes a huge difference in the growth they’ll achieve by December. This picture was taken October 11th. The lettuce is twice as large now AND it has already been harvested numerous times. This picture was taken October 28 through the garden fence. You can see the hoops in place for the plastic to go over them and also you can see how we’ve stabilized the hoops with strong string which is anchored in the ground. This lettuce too has already been harvested many times. I started it in September. If for some reason I loose seedlings planted in August or September —- I’ll keep planting through October and November if necessary. BUT those things won’t do as well until the coming Spring. Without that extra light and warmth to establish good growth — I just won’t get as much harvest from the plants in the winter. 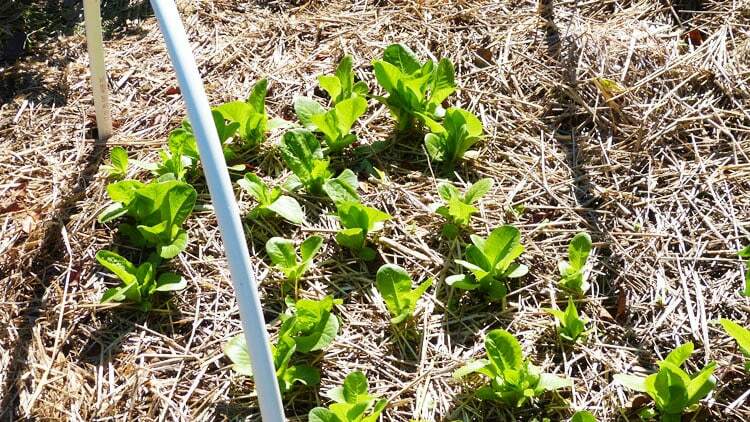 #2 – You don’t have to garden long to make the observation that you’re not going to get as much lettuce in December, January and February —- no matter when it was started — as you will in March and onward when conditions (light and warmth) are more suitable for growth. Growth in low light, cold months can be 3 times less than at normal growing conditions. You get some growth— but much slower. Certainly enough to satisfy the craving for winter salads. Even planting in October and November gives you a jump on things in March because they’re already growing and with the continuing change in light and temperature will quickly produce for you while you’re waiting for your Spring plantings to germinate. I know light (or the length of the nights) effects all kinds of plants. I always wonder about my mums. The ones in the front of our home that get continuing artificial light from the street lights bloom almost a month later than my mums in the back that don’t get the light. Some varieties just might be late season mums— but some are the same variety as in the back. Green house mums are forced to bloom early by keeping them in the dark longer. This topic can be fun to think about. If you want to read more here’s a link about day length effecting vegetable production and here’s one about flowers. This day length (or night length) business can get complicated. A person could get to thinking that they can’t grow anything without just the right conditions. That’s just not true. So have fun knowing this — but use the basics for your benefit and forget the rest unless you’re into lots and lots of details just for the fun of it. 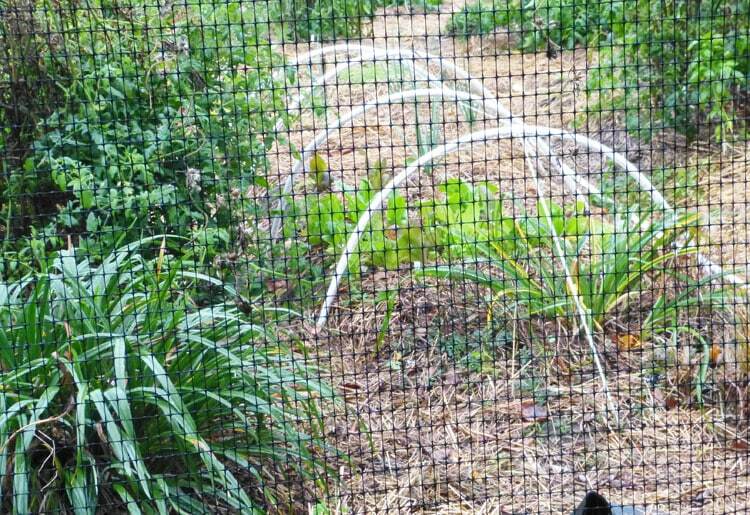 Organic Gardening is easy, effective, efficient —- and a lot heathier. All content including pictures are copyright by TendingMyGarden.com All Rights Reserved. That stabilizing string is genius!! Well done. I can’t wait until its time to start planting again. Winter sowing is so relaxed and no rush. I was going to replant spinach now, but I think I’ll wait until later and do it winter sown. I thought of you when I chose the picture Sandra. I wanted you to see how Bill stabilized the hoops. It really works well — but time will tell even more. I’ll also add more pictures when we cover with the plastic to show you how we plan to stabilize that. I really enjoyed this article, Theresa! Thought your readers might like to know the U.S. Naval Observatory has a website (http://aa.usno.navy.mil/data/docs/Dur_OneYear.php) where you can type in your city and state and see hours of daylight for your location for any given year. For instance, I live in central Oklahoma. From this site I found that my daylight hours drop below 10 per day on Nov. 28 and return to more than 10 hours on Jan. 13, 2013. The noted garden writer Eliot Coleman refers to the less-than-10-hours-of-daylight days as “Persephone days,” in recollection of the Greek myth of Persephone. She was kidnapped by Hades, the god of the underworld, in autumn. Her mother Demeter, the goddess of the harvest, was inconsolable and caused all crops to die. Faced with the end of life on earth, Zeus, the king of the gods, sent his messenger, Hermes, to Hades to demand Persephone’s return. Hades said she could return if she had not eaten anything while in the underworld. But Persephone had eaten four pomegranate seeds; therefore, she had to return to the underworld four months of every year. This corresponds roughly with our months of winter when crops do not grow.